Last year brought a spectacular confirmation that binary star systems predominate in our galactic neighborhood, and that they are capable of generating viable planets. 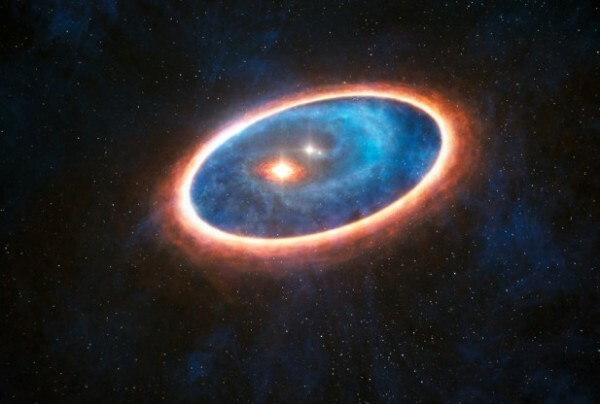 The image below shows a star system that was previously thought to be a binary, but has now proven to be a triple star system with the help of improved telescopes and imaging techniques. > GG Tauri, "The Feeding Twins - Scratch That - Triplets"
The below image shows an embryonic binary star system that has been in existence for only about six millions years. The newly operational multi-national ALMA telescope array located in the high desert of northern Chile was constructed to study this and other developing star systems, and gives us our first "real-time look-in" at a planetary world in development. > L1551 NE, "The Birth of Little Twin Stars"
Image Credit: ALMA (ESO/NAOJ/NRAO)/ Takakuwa et al. The next image is that of a more widely separated binary system, and one in which the gravitationally bound stars have their own proto-planetary discs that rotate in different planes. > HK Tauri, "The Misaligned Twin Star System"
In the study that follows, it will be shown that the double-star origin of our own solar system is preserved in a very unexpected place, that is, the Book of Genesis. We will also discover that Genesis not only provides a descriptive model of our own solar system's formation, but a comprehensive picture of where intelligent life formed in our galaxy. It is this latter subject that we will explore first.